The FAA requires each private pilot to carry emergency supplies, not only for him/herself, but also for the number of passengers on board who could also be stranded in a remote location and have to fend for themselves either until help arrives or until they hike out to find some. My husband and I think that this is such a prudent idea that we also apply it to our car and snowmachines. Each one has an emergency bag, too. Even our home, in a way. Because it is small, we store clothes, food, matches, and supplies in various outbuildings. Perhaps some of those structures will be unimpaired even if our cabin is damaged by fire or earthquake. Each year, we re-evaluate our “to-go bags” with the goal of reducing weight/bulk while improving efficiency and effectiveness. Currently, the largest (blue) one (for the plane and snowmachine) weighs about 25 pounds. The small (black) backpacks weigh about 10 pounds. Below is an annotated list of our seasonally varied supplies and how they are organized. For the car and home, we store the supplies in convenient, “grab and go” backpacks. But those canvas and even nylon bags got soaked on snowmachine trips, so we bought instead a large rubberized dry bag at a camping and kayaking store (it has shoulder straps). We toss this in the back of the plane or snowmachine, depending on the trip. 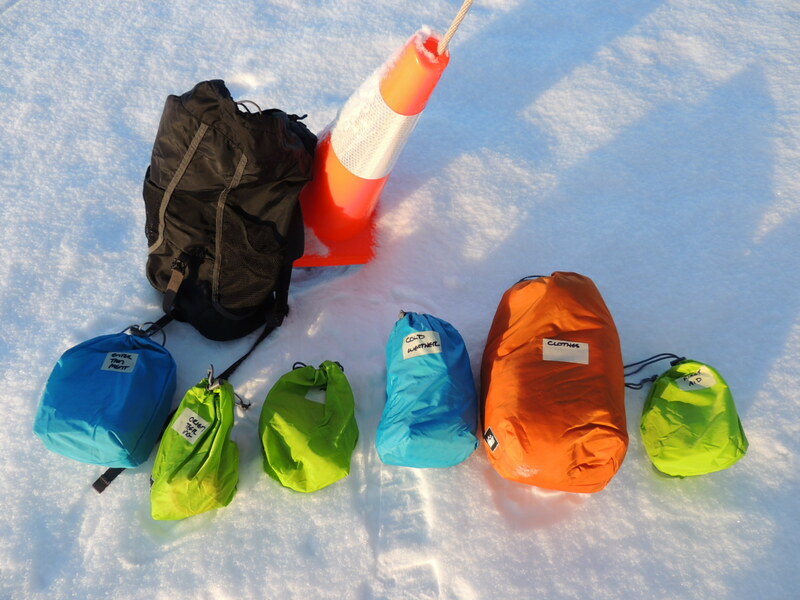 Inside of each bag are six, small, color coded nylon sacks labeled as follows: clothes, fire/warmth, food, first aid, orienteering, and entertainment. The last may sound silly, but anyone who has been stranded on a highway for several hours due to an accident knows that a deck of cards or a paperback novel can soothe frazzled nerves during an anxious wait, so I include both, plus pen and paper. In any case, this is the least important component, and is, therefore, stashed at the bottom of the bag. Clothes and fire/warmth sacks are stowed closest to the top of any bag or backpack, as they are presumed to be the highest priorities. For each of us we pack long underwear, a long sleeved shirt, pull on pants, socks, and seasonally appropriate hat and gloves. The summer bags also include a poncho, a mosquito head net and two small containers of DEET. The heat bag contains two forms of firestarter (such as waterproof matches and a magnesium striker), some type of tinder (such as paper or cotton balls soaked in Vaseline), chemical hand/foot warmers, an emergency blanket (one of those silver, reflective ones) and a paracord bracelet which can be unwound to hang the blanket as a tarp to reflect the heat of a fire or to provide shelter from rain. The big drybag even has enough room to hold a sleeping bag, a bivvy sack, and small tent. We feel competent to forage for fuel, such as birch bark (even when damp) and dry spruce boughs at the base of trees. Food obviously pertains to warmth, too. The food sack contains a tiny portable cook stove (with a single cup and spoon), two – one pound butane tanks, a bag of dry tea, soup, lemonade, a heatable freeze dried meal and a half dozen power bars – enough food for three (somewhat hungry) days. Two fishing hooks are stuck in a cork, and wrapped in a length of fishing line of my small bag. A trot line is stored in the big bag. Familiar with some of the area’s edible native plants, such as dandelion, fireweed, fiddleheads, and plantain, we could forage for a few summer calories, too. Obviously a source of clean water is the most important component. Melting snow is feasible in winter, but we also carry a wonderful “straw for life” which filters drinking water from virtually any source. This bag also includes a multiplex tool, like a Leatherman. Our first aid kit is pretty minimal and is probably our weakest part. It contains burn cream, Neosporin, bandages, moleskin, aspirin, latex gloves, a metal pin, a sliver of soap, a few days worth of toilet paper, a rag and two garbage bags. We know enough about the region’s native plants to slap on some yarrow or plantain to staunch bleeding, make a poultice of chickweed to draw out infection, and layer shoes with alder leaves to relieve sore feet. I need to include a back up pair of glasses. My husband and I do not take any regular medications, but for other people, this would be an important addition to update regularly. The orienteering supplies in each bag are intended to help us navigate toward safety or to attract rescuers to our location. They include a headlamp, two compasses, two whistles, three glow sticks, and a signal mirror. A fire can be a signaling agent, too, as are universally understood ground markers made with branches. Extra Tools: Depending on the mode of transportation, we carry additional supplies. These include, for example, a fold-up shovel with a saw in the handle, a rope or come along, a utility knife, a hammer and Allen wrenches, and extra power belts. 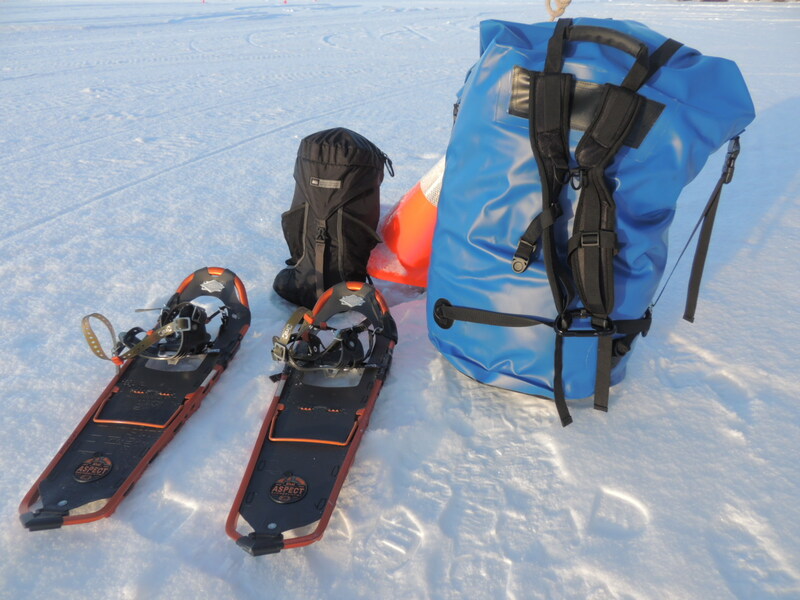 In winter, we always carry a pair of snowshoes (plane or snowmachine). Naturally, there is a roll of duct tape somewhere, and some rags. For communication, my husband carries a ham radio and usually has his cell phone, too, when traveling cross country on snowmachine. We know particular spots on his regular route where each one works, and how far that is from shelter or a “frozen highway” as we consider the rivers, in winter. The plane is equipped with an ELT (emergency locator transmitter), GPS, and a handheld aviation radio. The car holds extra oil, transmission fluid, maps, and fix-a-flat. We do not carry bear spray in the plane (too dangerous if it sprays). We do often travel with a gun, for moose or bear. Of course I know that we have not thought of everything. More knowledgeable friends give us good advice every year. No doubt, at some very inconvenient moment, we will figure out some $1/ 1 oz lifesaver that we don’t have and absolutely do need. For readers, I recommend on-line resources, such as the Red Cross and FEMA, which offer very informative lists. From them, I learned the importance of including personal ID and emergency contact names/numbers. Duh. I hadn’t thought of that! A number of vendors sell their versions of emergency supply bags for people who prefer not to assemble their own. (Some seem really weak). This is, like just about everything we do, an ongoing project. Our packs may never be complete, but I do believe that the process of assembling and organizing these emergency bags alerts us to dangers and helps us anticipate vulnerabilities and therefore, priorities, which may enable us to withstand a few days on our own, if necessary, in some emergency situations. By Laura Emerson. Originally posted on her blog about off-grid living here. What do you think we are missing? What do you include?